All you need are a few simple ingredients. No cooking is involved. 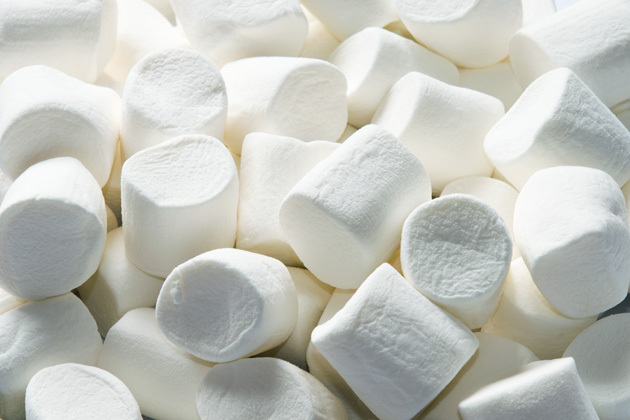 Begin by shoving a pretzel stick into the flat side of a marshmallow. Then connect it to another marshmallow in the same manner. This is the snowman's torso. 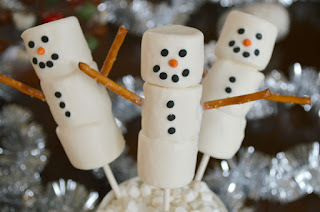 Add another pretzel stick and connect another marshmallow for the head. You've now finished the body of the snowman. Next, push two or three chocolate chips into the front of the snowman to create buttons. Using your black frosting gel, draw the snowman's eyes and mouth. Create the carrot nose with a dot of the orange frosting gel. To create the hat, squirt a small dab of either color gel onto the bottom of a chocolate bell candy. Affix the candy to the top of the snowman's head to serve as its hat. The gel will help it stick. Finally, use two pretzel sticks to create arms for the snowman. That's it! You're all done. Now eat that snowman! There are a ton of ways you can customize this fun activity, including a licorice scarf and different colored gum drop hats. Go nuts!